Piaggio, an Italian company, is known for its elegant scooters in the market. Now, the company is launching another hot looker this September, the Vespa Elegante. The Vespa Elegante is an India-specific scooter which is going to be an accessorized version of the Vespa VX. 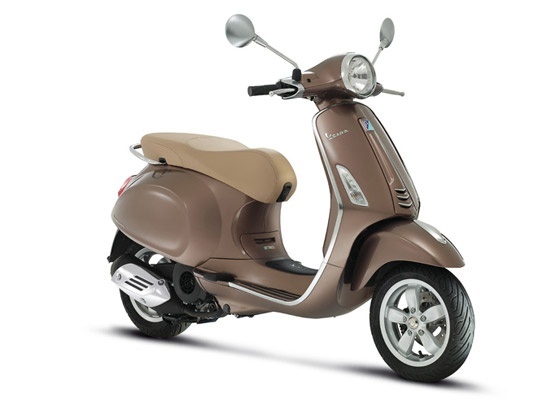 The exclusive scooter will be come in Crete Senesi Brown color that is seen on the Vespa Primavera. The Elegante will also come with broader split seat which is finished in a light brown color. A foldable front-apron mounted carrier and Elegante badges are the other possible additions. The Elegante’s ex-showroom price could be Rs. 79,000. The Elegante will use a triangular front grille and the round headlamp will be retained. The seats of the Elegante will adopt a split design to give it a retro look. The Vespa Elegante will be powered by the same 125cc engine that powers other scooters in the Vespa range. This engine produces 10 BHP of power and 10.6 Nm of torque. Piaggio offers a host of customization options for buyers of the Vespa scooter. Since the number of customers are less, buyers prefer to keep their scooters slightly exclusive by opting for these customisation options. Tubeless tyres and a disc brake for the front wheel and a drum brake will handle braking at the rear wheel.